Digital art is making waves across the healthcare sector as hospitals, clinics and dental surgeries embrace a need to create healing environments in line with evidence of a direct link between visual stimulation and the brain’s reaction to pain, stress and anxiety. One of the most recent adopters of new media art, the sector is rethinking healing spaces. Transforming environments, art can nurture not only patients but families and medical staff. Traditionally hospital and clinic waiting room screens entertain patients with daytime TV, music videos or rolling news, rarely vetted, and often violent, loud or disturbing – not ideal for creating a calming environment. Art has been proven for centuries to heal and restore and is finally being harnessed by designers and managers of clinics and hospitals to aid the recovery process or simply to alleviate anxiety in patients. The healing properties of hypnotic, immersive visuals are hugely beneficial to a patient’s wellbeing. Decades of extensive research reiterates the need for environments conducive to healing to be put in place at medical institutions. Working hand in hand with traditional medicine, a calming visual and sensory experience can help maximise holistic healing. Doctors and other medical staff bear responsibility for the wellbeing of their patients and are increasingly alert to the idea that creating a curative environment is part of their remit. Although the benefits of art in medical waiting areas, wards, private treatment rooms and hospital rooms have long been accepted, they have not been widely embraced, beyond traditional pictures and prints. Increased awareness of the benefits of mindfulness and engaging experiences has allowed digital art, displayed on screens or through projectors, to bestow a more immersive atmosphere in health environments. Interactive works, especially those that react to motion, allow a patient to become one with the art, offering a calming and distracting effect. 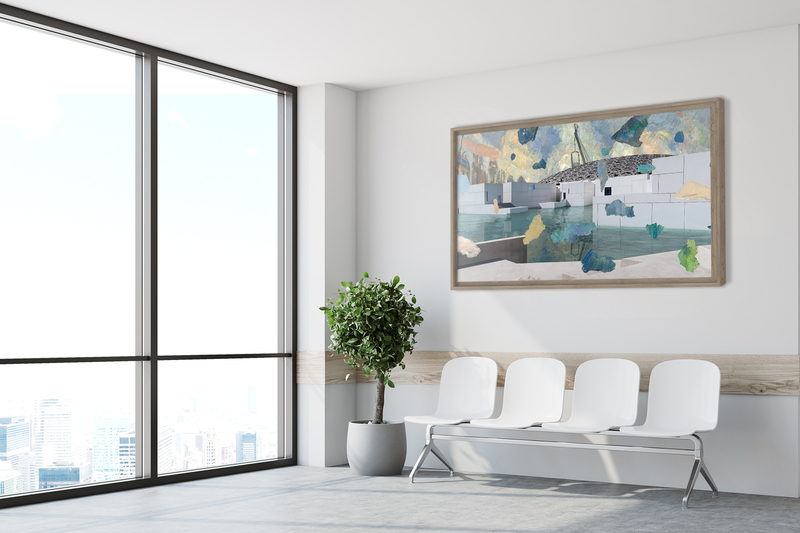 The beauty of this design concept is that existing screens can be used, minimising cost, art can be rotated, which keeps the environment fresh and patients can select the works they enjoy most. The concept of moving, rotating art is particularly engaging for children. Becoming increasingly confident and empowered, patients are demanding more from their doctors, dentists and other therapists, particularly in private medicine, where comfort and thoughtful surrounds are high on the list of priorities for those selecting where their treatment takes place. Private clinics and hospitals cater for those who can afford to pay for their exclusive services, usually in elegant buildings, furnished attractively and featuring premium art – on walls and on screens. Digital art is fast becoming a key element of the new trends in high-end health institutions. Medical organisations are not the only ones embracing the restorative quality of video art. Homes for the elderly and wellbeing retreats are installing digital screens around their premises to engage, inspire, or even distract those with ongoing concerns or anxieties. These are spaces already equipped with practical and medical equipment and experts, yet the potential to do even more to help recovery has traditionally been left untapped. When functionality is already in place, what better medium than art to stimulate the healing process? Niio’s unique digital art platform offers seamless access to the world’s finest gallery-quality video art, bringing curated rotating collections to the hospitality sector, to public spaces and most recently to early adopters in the healthcare sector, notably to Clinic A in Hong Kong. Through our platform, collections of high quality video and media art are displayed in public waiting areas, wards and private rooms in the clinic. Our subscription model negates the high costs of acquiring individual pieces of art and our tech platform builds relationships between medical institutes and local artists, creating a community bonded by its aspirations to inspire and heal. Artists submit their work to Niio’s platform and with one click their work is screened in local hospitals. We are delighting in the impact of our work in the healthcare sector, fulfilling our ethos of inspiring people everywhere with potentially curative art. Hospitals around the world continually conduct patient satisfaction surveys to guide them towards improving their buildings. It has become clear that falling ill motivates in some people a desire to be engaged with life, and in a bid to absorb the beauty of the world, awareness of their surroundings becomes heightened. Creating art or simply seeing and becoming immersed in art, can allow people to express thoughts and emotions, often hard to put into words, especially at difficult times of illness. Art has been documented as a powerful aid to lowering stress levels, enhancing relaxation and shifting the focus away from pain or stressful thoughts. Indeed compelling reasons for hospital management or leadership teams to take the décor of their institutions extremely seriously. And they are. 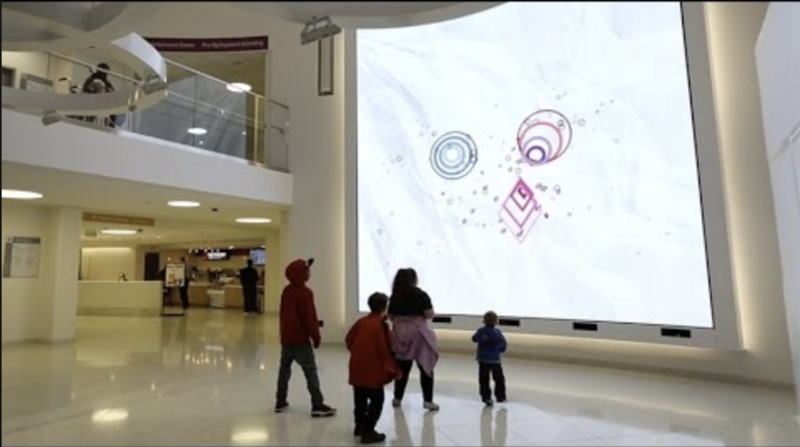 Designed by the University of Connecticut, the new interactive media wall at Boston Children’s Hospital was built to make happy, positive memories for people going through difficult times. It works because it feels very human. Children run across the floor and a life-size giraffe imitates them. They run towards the screen and the shapes change with their movements. It’s mesmerising and unique. Pioneering architects and designers strive to reimagine spaces as our fast-paced digital world continues to change. Customers are demanding designs that reach beyond functionality and they are seeking a platform to help them create unique, relaxing and healing experiences. Niio is the go to platform for new media art integration in the healthcare sector and beyond. Rolling out curated rotating collections to private clinics across the world, Niio’s platform is trusted by leading artists and galleries to securely deliver and display immersive experiences. Partnerships with leading global display manufacturers including Samsung and Phillips, as well as with local certified partners for installation and support, ensure the reliable yet thrilling transformation of your healthcare building into a restful, curative and inspiring environment.